Snow Daze | "In good writing, WORDS BECOME ONE with things." 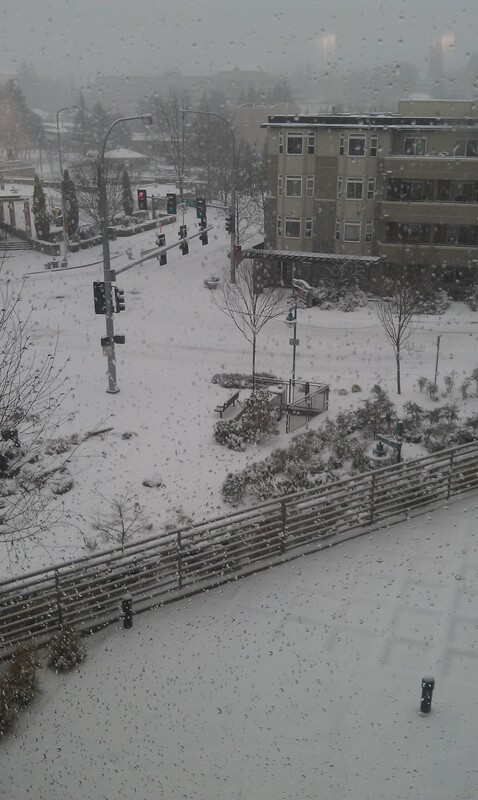 A funny thing happens when it snows in Seattle like it has in the last week: everything stops. Plans, commitments, meetings, driving, working (except for me). This sounds terribly inconvenient, but in fact, it is glorious. Nothing excites me more than normal life coming to an absolute halt. Do I have appointments that I wish I could have kept? Of course. But do I love that we all have to hunker down and do nothing more than be at home? Absolutely. In the last five days it has snowed off and on, accumulating to about four inches in Kirkland, two in Seattle, and many more further north and south of us. That is not a significant amount of snow. But when you live in a city that operates approximately three snow plows and sits on more hills than I can count, there is a lockdown situation. I have the privilege of wielding a double-edged sword called “I Get to Work from Home.” I am grateful that I get paid to sit at home with my laptop, but I am a little bummed that a “snow day” for me doesn’t mean I can frolic outside for six hours. And I am fully aware of how obnoxious that attitude is for those who can’t work from home and have to take a vacation day or who just won’t get paid. Three cheers for whining about blessings! 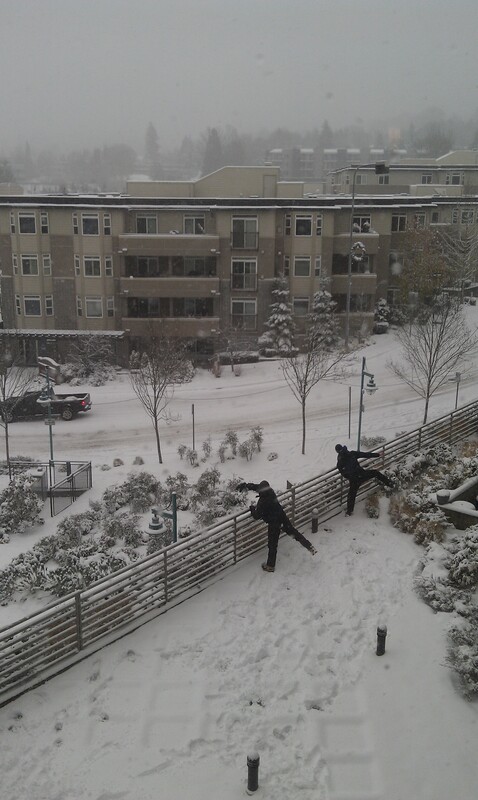 One of the funniest parts of witnessing a Seattle snowstorm is watching the residents’ reactions. For those of you who inhabit a colder climate than ours, you would find yourself wishing you could bottle Seattleites’ hollers of terror and drink them later for a nice buzz. Facebook is always the first thing to explode. Listen, I am a Northeast native, and despite the snows of my childhood being measured in feet rather than inches, I can honestly say that my feelings for Seattle snow run deep. I love that any amount of snow in Seattle means that my days will stretch from one relaxing evening to the next. I love that when I go to the store, half the aisles are empty because people are planning for the apocalypse. I love that no one so much as questions your inability to get anywhere. I love that people take to the streets like gold is floating down from the sky instead of snowflakes. Snow in Seattle also easily shaves about fifteen years off your life. Immediately you’re throwing on hats, gloves, heavy boots that are used once a year (and usually then it’s at a local ski slope), and heading out the door to smile at every person you see as you all converge to marvel at the transformed landscape. That and make snow angels like it’s your job. 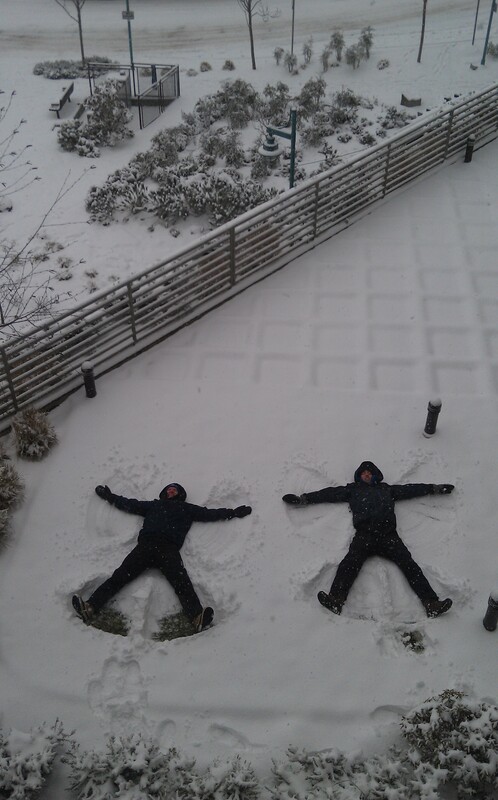 Mike and Phil decided that the pristine layer of snow on our building’s second story patio needed their impressions. Shortly after that, they spotted a friend of ours on his deck in the condo building across from us, and a snowball fight ensued — from building to building. Seattle snow days — yes, I’m all for Seattle snow days. B) While considerably shorter and with a shorter wingspan than Phil, Michael has the bigger wings on his angel. Phil is NOT going all out. Love that pic of the snow angels. LOL. And why is Phil’s leg lifted up like he’s peeing in the snowball fight?? Haha. Oh, I miss the snow! Come back!!!!! I want the snow back! This made me miss it. Regardless of how others make fun of us here in Seattle, I’ll always like that it makes most of us slow down. For once!